If Lobsters are dropped, one at a time, headfirst into rapidly boiling water, they die virtually instantly - before they can release any fear/pain induced adrenalin. Any movement, in the pot, is the result of a postmortem release of muscle energy. Lobsters may make a high-pitched sound when they are boiled. Although it sounds like they are crying, it is actually the result of gases being released under their shells. Boiling lobster should be punishable by law, but then you ARE punished in the RUINED flavor..
#2 You NEVER, EVER, EVER boil a lobster. This is a sin. 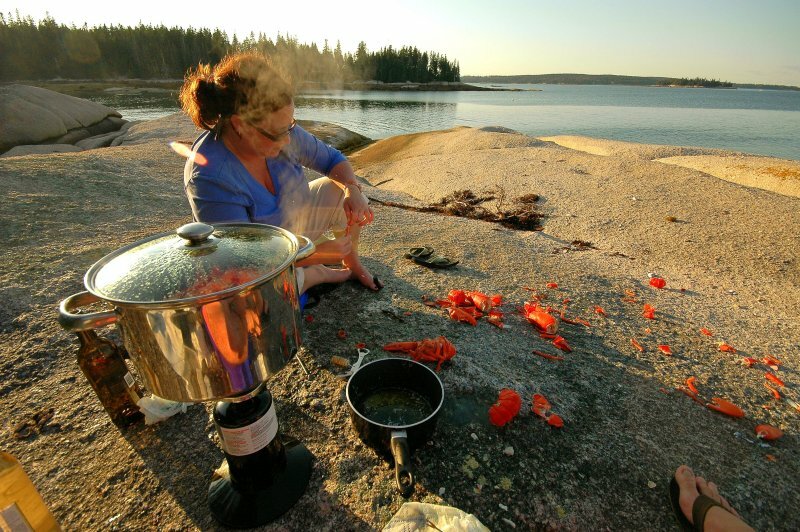 Lobsters are to be STEAMED on bed of FRESHLY picked rock weed. They should steam in fresh salt water. 1/2" of water is all that is necessary and the rock weed imparts that magical flavor.... You can add garlic or white wine if you want but steaming and rock weed produces the most tender and flavorful lobster. #4 Maine and Canadian Maritimes lobster tastes the best and YES it does vary. 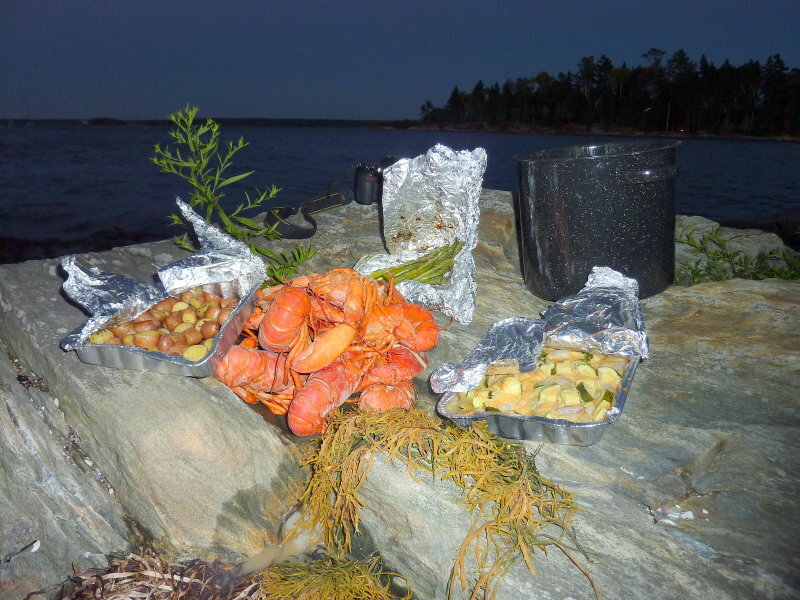 Even along the Maine coast the very tastiest lobsters only come from a few locations... Still any Maine or Maritimes lobster will taste better than a So. New England bug..
#5 When in Maine buy your lobster right off the boat. The lobsterman like the cash and you pay better than the co-op. This guarantees the most tender and fresh bugs you'll ever eat. #6 Remove rubber bands before dropping into the pot. With spiny lobsters, there really isn't much outside the tail. I clip open the underside and remove the meat, then butterfly, batter, and deep fry it. Take a foot long length of french loaf, cut it lengthwise, grill the bread with butter, put a layer of coleslaw on one side, then one or two of the deep fried tails depending on size, slap the other side on top, and walah... lobster poboy. You can also make a sauce with the liver, butter, flour, white wine, and a dash of worcestershire, and apply it to the top side of the lobster in the poboy, or dip the fried lobster in the sauce and eat it without the bread and slaw. I have made lobster jambalaya, lobster gumbo, and lobster fritters. Maine lobsters, the kind with claws, I just keep it simple and steam them. Lobsters are crustaceans, whereas spiders are arachnids. Crustaceans, arachnids, and insects are all arthropods; which are invertebrate animals, having an exoskeleton (external skeleton), a segmented body, and jointed appendages. If you go to the Lobster Dock in Boothbay Harbor, you pick out your lobster, they put a wire with a numbered tag on it, and drop it into a pot of boiling seawater. They call you when it's ready and serve it with corn on the cob and coleslaw. They don't steam it. I've had them steamed too, and I can't tell the difference between steamed and boiled. Some of you guys aren't too eager to try anything new, are you? They make awesome lobster dishes all over the world and it isn't all Maine lobster steamed with nothing but plain butter. Thai lobster? Chinese lobster? Mexican lobster? All ruined? They may all be wonderful, but they ain't lobster if they don't come with two claws. "Krab" meat and "sea" salad aren't crab meat, even if surimi can often pass for it. Lobster is lobster and the rest, is just seafood. As long as there's lots of it and fresh melted butter, that's just fine. When you dont have grass use a dish towel! This is the correct way..No boiling lobster or shrimp,just aint right! we used to do the old fashioned clambake--new england style-, chicken, lobster, clams, long island russet potatoes.. all kinds of blessed foods--i misss those!! THAT was eating!